Space Shuttle Endeavour is ferried by NASA's Shuttle Carrier Aircraft (SCA) over Houston, Texas on September 19, 2012, during a three-day flight to Los Angeles, where the shuttle will be put on public display at the California Science Center. California, here shuttle Endeavour comes, right back where it started from. NASA's space shuttle Endeavour left Houston for the Golden State today (Sept. 20) on the second leg of its cross-country trip to Los Angeles, where the orbiter will ultimately become a museum piece. 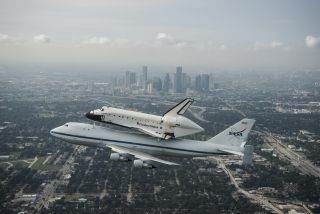 Endeavour, riding piggyback atop a modified Boeing 747 jumbo jet, took off from Ellington Field in Houston at 7:03 a.m. CDT (8:03 a.m. EDT/1203 GMT) and is headed for NASA's Dryden Flight Research Facility in Southern California later today, its final pit stop before arriving in Los Angeles on Friday. The shuttle left its Florida home port at NASA's Kennedy Space Center on Wednesday to kick off the three-day trip, which is NASA's final space shuttle ferry flight. NASA will broadcast Endeavour's arrival at Dryden live on NASA TV and via an online webcast. Find out how to watch Endeavour land live here. "Space shuttle Endeavour's final ferry flight has in a way become a traveling museum, an early start to its exhibit at the California Science Center," said Robert Pearlman, editor of the memorabilia and space history website collectSPACE.com, a SPACE.com partner and contributor. "So many people are getting a chance to see the shuttle up close — and atop the jumbo jet Shuttle Carrier Aircraft to boot! — that you can't help but wish the flight wouldn't end Friday in Los Angeles." Thousands of onlookers watched Endeavour leave Florida as the shuttle flew over the state's Space Coast one last time. In Houston, the home to NASA's Johnson Space Center that houses the shuttle program's Mission Control room and astronaut training center, Endeavour's stopover was a welcome sight. "Perhaps most poignantly, Endeavour's delivery along the southern half the U.S. has offered the opportunity to pay tribute to the workers who made NASA's space shuttle program a success," Pearlman said. "The stopover in Houston gave thousands at the Johnson Space Center an opportunity to say one last farewell to the vehicle and program they led for 30 years." Endeavour is NASA's youngest space shuttle and destined for public display at the California Science Center, its final retirement home now that NASA's orbiter fleet is retired. It made its first flight in 1992 and final flight in May and June of 2011. In all, Endeavour flew 25 space missions. The flight to California is a homecoming of sorts for Endeavour. The shuttle, along with NASA's other orbiters, was built in Downey by aerospace company Rockwell International, which ultimately became part of Boeing, to replace the orbiter lost in the tragic Challenger shuttle accident of January 1986. On Wednesday, Kelly said he hoped Endeavour's ferry flight would fly over Tucson so he and his wife Gabrielle Giffords, the former Arizona Congresswoman, would have a chance to see it in flight. Kelly said he also hopes to see Endeavour parade along the streets of Los Angeles when it moves from the Los Angeles International Airport to the science center in mid-October. Endeavour is the third of the four NASA space shuttles heading to museums this year. The shuttle Discovery was placed on display at the Smithsonian Air and Space Museum's Stephen F. Udvar-Hazy Center in Chantilly, Va., in April, with NASA's Enterprise shuttle prototype going on display in New York City's Intrepid Air and Space Museum in July. The shuttle Atlantis, meanwhile, remains at the Kennedy Space Center and will be delivered to the nearby Kennedy Space Center Visitors Complex on Nov. 2. Atlantis' public exhibit will open in summer 2013. NASA retired its space shuttle program in 2011 after 30 years of spaceflight and 135 space missions. The space agency plans to use commercial spacecraft to ferry astronauts to and from low-Earth orbit while developing its own new spacecraft and rockets for deep-space exploration.